For those not familiar with Freemasonry, understanding the organisation and what membership entails can be a daunting task. To assist those in need of knowledge, we have many websites with information regarding the order, including this the Grand Lodge of Antrim website. Freemasonry cannot be explained in a few lines of text, nor can it be encapsulated entirely within all the web pages, booklets or guides combined. Rather, understanding Freemasonry and all that it entails can only be gained from experience. In the early days of the 18th Century communication between Dublin and the rest of Ireland was slow, irksome and inconvenient. Travel between the Capital City and other major towns was done largely by coach which was costly and often irregular. Even by 1788 the mail coach journey between Belfast and Dublin took 3 days and often much longer in winter. As a result Lodges were, by necessity, largely independent and worked in accordance with their own ideas. Committees were established between Lodges in order to achieve some regularity and uniformity in their observance of the Laws and Regulations. Only matters deemed to be of primary importance were submitted to Grand Lodge for approval. This system operated over several years until the report of Grand Lodge dated 27th December 1828 indicated coming changes. This was indeed the first official intimation that changes in the government of the Order were going to be implemented – that the old system was about to make way for a completely new one. Very little happened until 1833 when the Brethren of the Northern District of County Antrim, under the leadership of the Rev. Walter Bishop Mant M.A., Archdeacon of Connor, won the approval of Grand Lodge to form the Provincial Grand Lodge of Cary and Dunluce – a geographical area that was approximately 18 miles by 12 miles. It covered the north coast between Ballycastle and Portrush and extended southward to Dervock, Stranocum and Armoy. As “Cary and Dunluce” was the first application for Provincial Grand Lodge status it claimed seniority for the new Province. Lodges 38, 48, 223, 229, 280, 337, 414 and 1001 recommended the Rev. Walter Mant to be Provincial Grand Master and this recommendation was approved by Grand Lodge. It is interesting to note that three of these Lodges are still in existence – Nos. 38, 280, and 414. The Rev. Mant was Installed as Provincial Grand Master of the northern part of County Antrim at a ceremony in Dublin on 6th March 1834. The first meeting of the new Provincial Grand Lodge took place in the Lodge rooms of Lodge No.229, Dervock, on Tuesday 2nd June 1834. When the Provincial Grand Lodge of Cary and Dunluce began working, a similar body for South Antrim was mooted which met with serious and sustained opposition from a number of the older Brethren who were unwilling to part with their independence. However, a large number of Masons from Belfast and South Antrim, including the Committee which governed the area, petitioned Grand Lodge for the formation of a Provincial Grand Lodge and nominated the Marquis of Donegal as Provincial Grand Master. 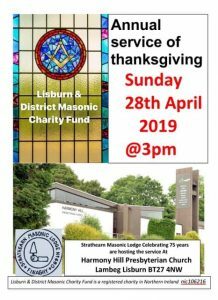 This was approved by Grand Lodge and Archdeacon Mant was the Installing Master of the new Provincial Grand Lodge of Belfast, Antrim and Masserene. County Antrim remained in two parts until 1848. At this point in time, the Belfast Masonic Committee, which had held power for many years, ceased to exist. Archdeacon Mant, on receiving a Clerical promotion in 1835 to Archdeacon of Down, moved to County Down and subsequently formed the Provincial Grand Lodge of Down. However, he did not resign his office as Provincial Grand Master of Cary and Dunluce until 1846. Many of the Lodges in County Antrim – particularly those in the rural areas – carried on as before and remained outside the remit of the new Provincial Grand Lodges. Grand Lodge was insistent that they should not be forced, against their inclinations, to join. In due course opposition declined and those Lodges eventually joined Provincial Grand Lodges, resulting in unity for the work of the Province. The separate Provincial Grand Lodges of Antrim and Down – formed on the basis of geographical boundaries – came into being in 1868 and have remained in place ever since.